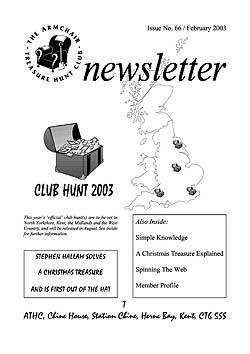 Cover Photo: Club Hunt 2003 will be launched in August and is being set in four areas of the UK. Sandra Young formats Dave Blakeways latest hunt, Simple Knowledge. Mike Smith provides the solution to A Christmas Treasure. Nick Perry, WebMaster, drums up a bit of business in Spinning The Web. At last we get round to publishing the Member Profile for Susanne Stacey. Minnesota Obsessives is an extract from a recent article in The Times about what our friends across the pond have been getting up to since 1952. Brian is unable to come up with a title for his article on this years club hunts, but does reveal some of the thinking behind the decision to stage four hunts. Sandra Young opens the curtains on A Thespian Mystery and whets your appetite for a day out in Herne Bay. As if a Spring Event is not enough, Roger Lintott brings us A Springtime Holiday treasure hunt. We have an account of strange goings on as the successful team at the Spring Event in York 2002 finally experience the Sweet Smell of... Envelopes! 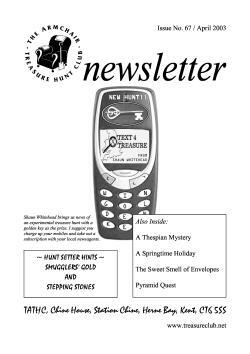 Private treasure hunts abound as Shaun Whitehead describes the Pyramid Quest set for him and his wife, Alison, by Alan Gregory. An important update on Smugglers Gold is provided by hunt setter, Shaun Whitehead. Featuring strongly in the April issue, Shaun brings us news of his latest experimental treasure hunt in Text4Treasure. Roger Lintott brings us an update on A Springtime Holiday and describes the prize. We have High Drama in Herne Bay as Clive Weatherley brings us an account of this years Spring Event. 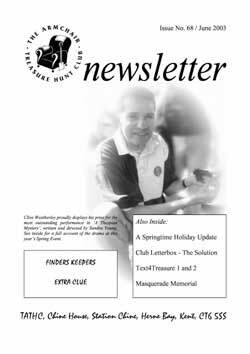 For those of you still searching Dartmoor, Clive also brings us Club Letterbox - The Solution. ... and brings us news of Text4Treasure2. Shaun reminds us in Masquerade Memorial that we need to firm up on our plans to commemorate the birth of armchair treasure hunting. News of this years September Event is brought to us by the organiser, Shaun Whitehead. Cover Photo: Clive Weatherley examines the Text4Treasure prize he found at the base of a sycamore tree adjacent to the Wellington Monument in Hyde Park, London. Brian Souter brings news of The Da Vinci Code. 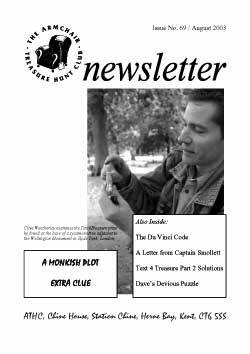 Ann Hughes offers an additional clue to solving the 2002 Club Hunt, A Monkish Plot. Finally, we are able to include the Member Profile for Shirley Haigh. Shaun Whitehead brings us news of the September Event in A Letter from Captain Smollett. The solutions to Text4Treasure 2 are provided by hunt setter, Shaun Whitehead. Jan Rogers reveals how a small team of dedicated treasure hunters finally called house on Dave Blakeways hunt. And Dave reveals how it was done in Easy Peasy Solution. Cover Photo: Squire Clive Trelawney, Long John Perry, Dr Matt Livesey, Lady Alison, Captain Shaun Smollett and Mikey Jim-Lad Smith gather outside Brooksby Hall near Melton Mowbray. 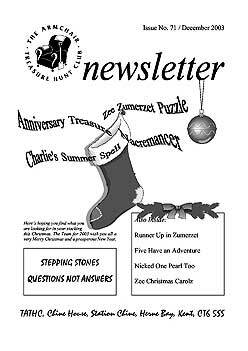 There's lots to get excited about as Brian Souter introduces not one, not two but five new treasure hunts. The Whistle Pig by Duck Miller is reviewed by Clive Weatherley in Tales of the UnexPIGted. Paul Corby reveals all in Member Profile. 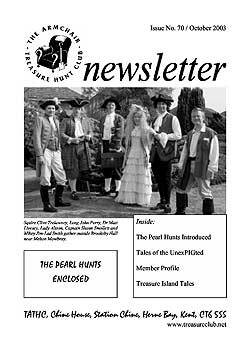 Shaun Whitehead brings us an account of this year's September Event in Treasure Island Tales. Cover Photo: Here’s hoping you find what you are looking for in your stocking this Christmas. The Team for 2003 wish you all a very Merry Christmas and a prosperous New Year. Ann Hughes describes how she was Runner Up In Zee Zumerzet Puzzle. Martin Dennett explains why the Somerset countryside has positively buzzed with activity in recent weeks. Paul Harkin describes how he solved Charlie’s Summer Spell and dispatched Martin to retrieve the pearl. Member Profile this issue focuses on Simon Jacobs. Zee Christmas Carolz is offered as a festive puzzle by Roger Lintott. Charles Cunningham brings us Questions Not Answers about Stepping Stones.